And everyone laughed because it was two in the morning, the drinking had started at mid-day and it was a three-day weekend. Let’s start at the end. “The Best Things in Life Are Free.” Sure, Bert Cooper’s winking, wispy eyebrow waggling, song and dance number was a bit on the nose. Yes, it somewhat broke with the traditional Mad Men tone, but it was a true, poignant statement; a moment of pure glee that is not often found within the confines of SC & P or Don Draper and surrounding environs. 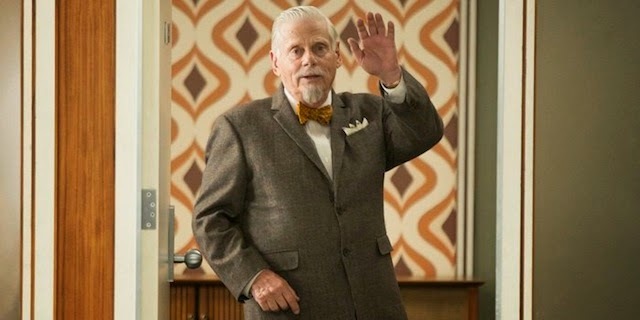 Mad Men has never shied away from the surreal and Bert’s post mortem show was in keeping with that tradition. Bert’s message in song is directly related to Anna’s message in cards. Realizing that we are not alone, also opens us to understanding that the best things in life are free. Peggy’s Burger Chef pitch has been all about the new American family—the people that form your support group amid TV squawks, changing generational tastes and the omnipresence of war. Don watches the moon landing with Peggy, Pete and Harry in an Indiana hotel room. Roger, Mona, Brooks and Ellory watch the moon landing from (presumably) Roger’s apartment—without Margaret. Betty and the Francis’ watch the historical event with a house full of guests. Bert watches the moon landing with his maid—though he probably would have wanted to watch it with the late Ida Blankenship, original astronaut. Bert hears Neil Armstrong’s famous declaration and then dies. Bert’s death couldn’t have been scripted or plotted any better. Sure, the show is ending, but regardless of that fact, Bert’s death and (thus the entire episode) truly feels like the end of a specific era for these characters. Even though Bert’s presence waned significantly after Season Three, he was still a figure to be reckoned with. More than any character in the series, he was able to grab Don by the back of the neck and get him to stand in line. Now he’s gone, and any immediate connection to the origins of the company—its founding generation of Sterling Sr. and Bert Cooper—is gone. And that emotion, that of time passing, washes over Don’s face as he watches his vision of Bert dance in front of him. Bert was in many ways like a father figure to Don—he was a brusque disciplinarian. Bert is dead and Don is no longer that ascendant, mysterious star of the advertising world, the man whom Bert advised to “pull back the curtain.” Don’s beautiful blonde wife is gone; his cherubian children are growing and have grown up without him. He’s lost his second wife because of his carelessness and inability to accept happiness and affection. All Don can do is look at his lost father-figure, exhale through his nose and fight back the tears in the corners of his eyes. There was such a sense of sadness pervading the very final minutes of the show. All of the partners overcame Cutler’s coup and will sell the company for huge profits; Joan will get her money and hopefully will be able to begin to forgive Don for his handling of Jaguar. Bert is dead. Peggy nailed the Burger Chef account with a pitch that was 20% Draper and 80% Olsen. Peggy has finally received the full, open support from Don that she was always looking for and, through all of the lessons she has learned in the past year, will most likely hit another gear in her career. When she looked back at Don and asked him, “Where are you going?” and Don said, “Back to work.” It felt like the end of their relationship, as we knew it. Sure, their bond will always be there, but now Peggy is fully on Don’s level. The pervading air of denouement, the release from the hectic plotting of the entire episode, was palpable in those last five minutes, up through and including Bert’s song and dance and ending with Don silently sitting on the random secretary’s desk, trying to steady himself as the loss for his old world swept over him. I’m obsessed with closure. I pay more attention to the last track on an album than any other song. There’s nothing I like to do more than guess at the end of an era or a changing of the guard in my life, in my friends’ lives, in the lives of musicians, artists and writers that I don’t know or who are already dead. So, excuse me if I’ve focused too much on trying to find clean breaks within this last episode of this partial season of Mad Men. However, even though I know that life doesn’t provide closure and that nothing truly ends even if you try your hardest to pretend it has and focused solely on moving forward, I can’t help but feel that when Mad Men returns things will be very different. Don appears resigned to simply do good work. He’s not grasping for power like he was back in Season Three or even Season Six. Subtly and suddenly, he’s made steps forward. I don’t know where this new mindset, or the new arrangement he’ll have at work will take him, but for a show that has been on for seven seasons, it’s pretty impressive that’s where we’ll pick up with Mad Men next year. In the meantime, I’m going to ignore the worst parts of Don Draper within me; the part that hears a song like Hamilton Leithauser’s brand new “I Don’t Need Anybody” and immediately sees a new theme song; I’m going to fight against the part of me that easily forgets the currency of making terrible jokes around a Memorial Day Weekend bonfire as soon as he steps into work. I’m going to take what’s free and enjoy it.